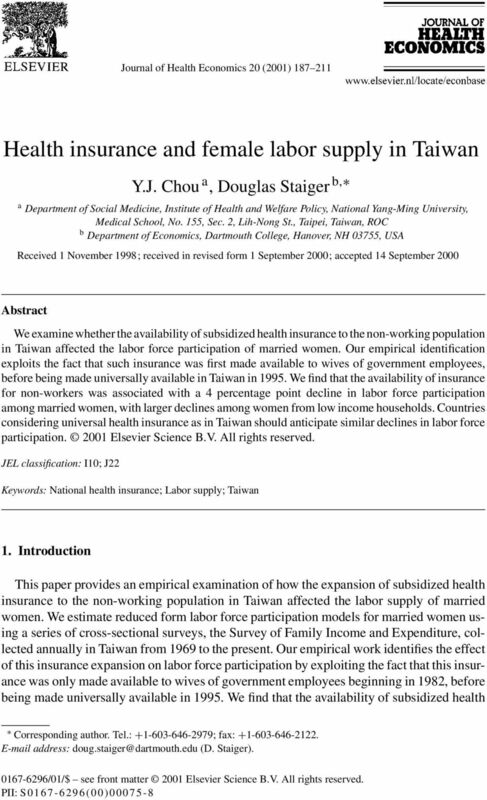 Download "Health insurance and female labor supply in Taiwan"
3 Y.J. 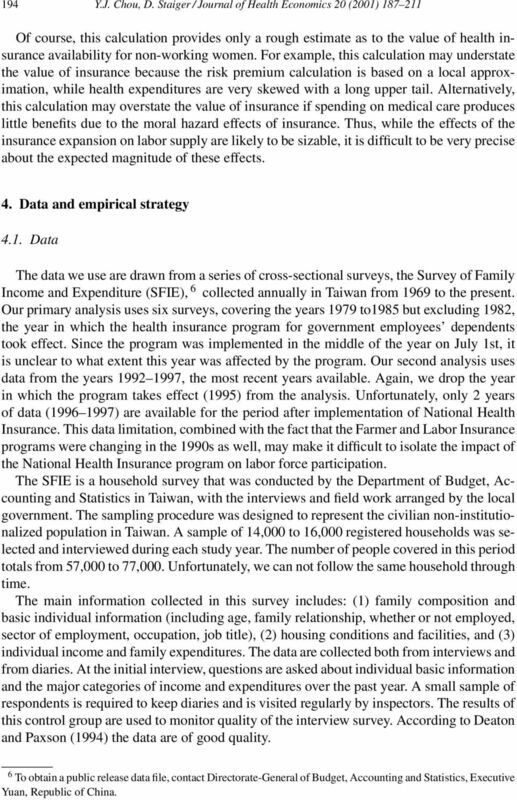 Chou, D. Staiger / Journal of Health Economics 20 (2001) coverage and the surveys from 1992 to 1997 to analyze the 1995 change. In both analyses, we estimate reduced form probit models of labor force participation among married women on the pooled data. We identify the impact of the change in insurance coverage by comparing the change in labor force participation among the affected women to the change among women whose insurance options were unaffected. We find that labor force participation of married women declines by about 4 percentage points after subsidized health insurance is made available to them through their spouses or through National Health Insurance. 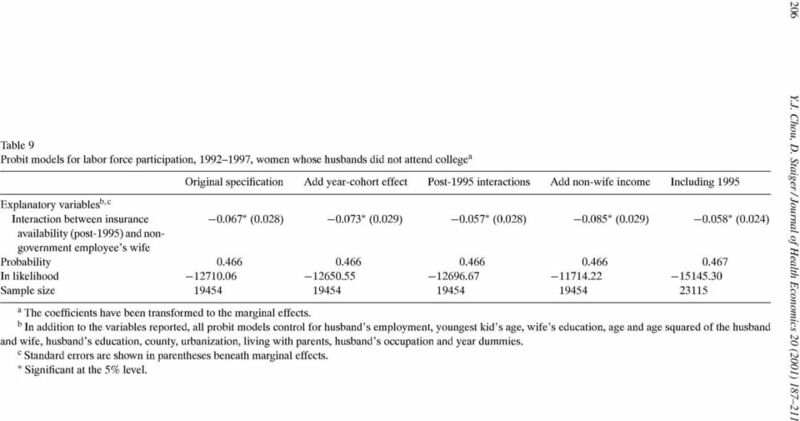 For wives of less-educated husbands, the effects are larger, up to twice as large depending on the specification. 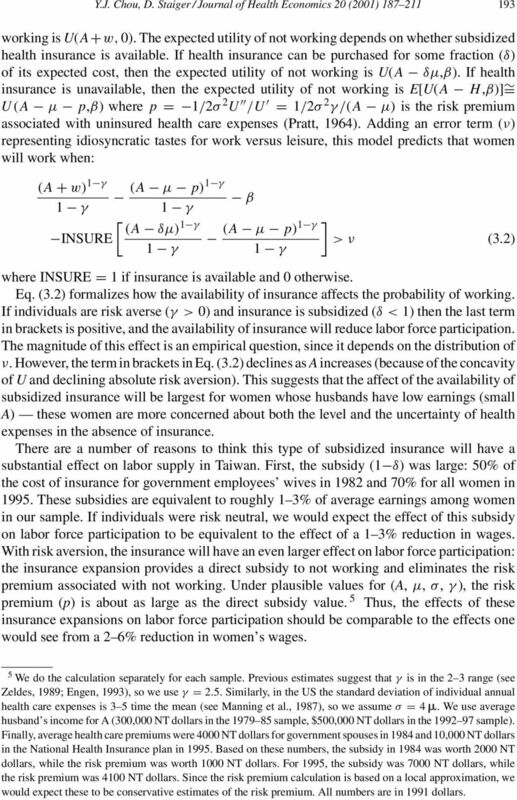 The magnitudes of both of these estimates are large relative to the expected value of the insurance subsidy being given to women, but are consistent with our model in which risk-averse women are reluctant to leave the labor force if they cannot purchase health insurance. Moreover, the magnitudes are large from a macro-perspective and may help to explain recent concern in Taiwan over a decline in labor force participation rates. Countries considering insurance expansions similar to Taiwan s want to consider these potential effects on their labor supply. 2. Background In March 1995, Taiwan implemented a new National Health Insurance program that provides health insurance coverage to the entire population. 1 Prior to this, the availability of health insurance was quite limited. Nearly half of the population was uninsured, and the remainder of the population received insurance through one of three government-sponsored health plans with virtually no private health insurance coverage available. 2 Three features of the pre-1995 health plans are particularly relevant to our analysis. Firstly, all the plans provide a similar range of comprehensive health benefits. Secondly, these plans were tied to a person s place of employment with premiums paid by contributions from the employee, the employer and the government. Finally and most importantly, until 1995 there was no coverage of spouses or dependents in the largest of these plans, Labor Insurance (LI), that covered all private-sector employees (roughly one-third of the population and two-thirds of the insured prior to 1995). Thus, for the most part, comprehensive health insurance was available to workers but unavailable for any person who was not working prior to March As seen in Fig. 1, the combination of no private market for health insurance along with limited availability of coverage for family members in the government-sponsored plans resulted in a large fraction of the population being uninsured. The Taiwan government provided some direct subsidies to providers for treating the poor uninsured and beginning in 1990 provided health insurance to very low-income households, but these programs covered less then 1% of health spending. As a result, prior to 1995 the average household in Taiwan faced out-of-pocket health expenditures that were both large and variable. For example, in the early 1990s roughly 50% of health expenditures in Taiwan were paid out-of-pocket, 1 Bureau of National Health Insurance, See Peabody et al., 1995, for an excellent description of the Taiwan health care sector. Also see Bureau of Labor Insurance, 1995, for historical background and statistical information on the Taiwan health plans. Except where otherwise noted, the information we provide in this background section comes from these two publications. 4 190 Y.J. Chou, D. Staiger / Journal of Health Economics 20 (2001) Fig. 1. Percentage of population with health insurance Taiwan with the average household spending approximately 3% of income on out-of-pocket health expenditures. Moreover, the distribution of out-of-pocket health expenditures was quite variable and skewed, with the standard deviation across households being 2 3 times the mean and the mean twice the median. 3 Prior to National Health Insurance, however, some of the government-sponsored plans were amended to provide coverage for family members, resulting in an increase in insurance coverage that is apparent in Fig. 1. Table 1 summarizes the major features of the three government-sponsored plans and how they changed through time. In July 1982, the health plan for government employees (Government Employee Insurance, GEI, which covered about 3% of the population and 10% of paid employees in 1981) was amended to provide coverage for dependents. Only spouses of government employees were covered in the initial stage. The parents and children of government employees became eligible in July 1989 and 1992, respectively. 4 The additional premium for a spouse (and dependents) was 3 5% of the government employees salary, with 50% of this amount paid by the employee. 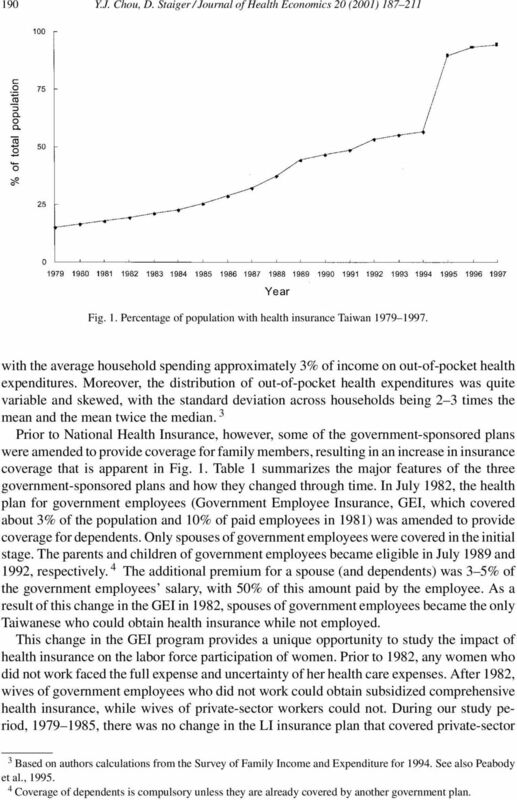 As a result of this change in the GEI in 1982, spouses of government employees became the only Taiwanese who could obtain health insurance while not employed. This change in the GEI program provides a unique opportunity to study the impact of health insurance on the labor force participation of women. Prior to 1982, any women who did not work faced the full expense and uncertainty of her health care expenses. After 1982, wives of government employees who did not work could obtain subsidized comprehensive health insurance, while wives of private-sector workers could not. During our study period, , there was no change in the LI insurance plan that covered private-sector 3 Based on authors calculations from the Survey of Family Income and Expenditure for See also Peabody et al., Coverage of dependents is compulsory unless they are already covered by another government plan. 7 Y.J. Chou, D. Staiger / Journal of Health Economics 20 (2001) working is U(A+w, 0). The expected utility of not working depends on whether subsidized health insurance is available. If health insurance can be purchased for some fraction (δ) of its expected cost, then the expected utility of not working is U(A δµ,β). If health insurance is unavailable, then the expected utility of not working is E[U(A H,β)] = U(A µ p,β) where p = 1/2σ 2 U /U = 1/2σ 2 γ /(A µ) is the risk premium associated with uninsured health care expenses (Pratt, 1964). Adding an error term (ν) representing idiosyncratic tastes for work versus leisure, this model predicts that women will work when: (A + w) 1 γ (A µ p)1 γ β 1 γ 1 γ [ (A δµ) 1 γ ] (A µ p)1 γ INSURE >ν (3.2) 1 γ 1 γ where INSURE = 1 if insurance is available and 0 otherwise. Eq. 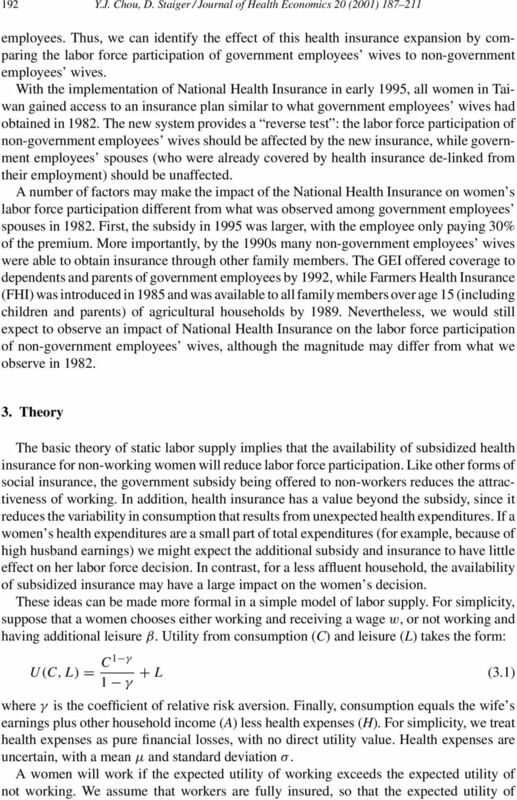 (3.2) formalizes how the availability of insurance affects the probability of working. If individuals are risk averse (γ >0) and insurance is subsidized (δ <1) then the last term in brackets is positive, and the availability of insurance will reduce labor force participation. The magnitude of this effect is an empirical question, since it depends on the distribution of ν. However, the term in brackets in Eq. (3.2) declines as A increases (because of the concavity of U and declining absolute risk aversion). This suggests that the affect of the availability of subsidized insurance will be largest for women whose husbands have low earnings (small A) these women are more concerned about both the level and the uncertainty of health expenses in the absence of insurance. There are a number of reasons to think this type of subsidized insurance will have a substantial effect on labor supply in Taiwan. First, the subsidy (1 δ) was large: 50% of the cost of insurance for government employees wives in 1982 and 70% for all women in These subsidies are equivalent to roughly 1 3% of average earnings among women in our sample. If individuals were risk neutral, we would expect the effect of this subsidy on labor force participation to be equivalent to the effect of a 1 3% reduction in wages. With risk aversion, the insurance will have an even larger effect on labor force participation: the insurance expansion provides a direct subsidy to not working and eliminates the risk premium associated with not working. Under plausible values for (A, µ, σ, γ ), the risk premium (p) is about as large as the direct subsidy value. 5 Thus, the effects of these insurance expansions on labor force participation should be comparable to the effects one would see from a 2 6% reduction in women s wages. 5 We do the calculation separately for each sample. Previous estimates suggest that γ is in the 2 3 range (see Zeldes, 1989; Engen, 1993), so we use γ = 2.5. Similarly, in the US the standard deviation of individual annual health care expenses is 3 5 time the mean (see Manning et al., 1987), so we assume σ = 4. We use average husband s income for A (300,000 NT dollars in the sample, $500,000 NT dollars in the sample). Finally, average health care premiums were 4000 NT dollars for government spouses in 1984 and 10,000 NT dollars in the National Health Insurance plan in Based on these numbers, the subsidy in 1984 was worth 2000 NT dollars, while the risk premium was worth 1000 NT dollars. For 1995, the subsidy was 7000 NT dollars, while the risk premium was 4100 NT dollars. Since the risk premium calculation is based on a local approximation, we would expect these to be conservative estimates of the risk premium. All numbers are in 1991 dollars. 8 194 Y.J. Chou, D. Staiger / Journal of Health Economics 20 (2001) Of course, this calculation provides only a rough estimate as to the value of health insurance availability for non-working women. For example, this calculation may understate the value of insurance because the risk premium calculation is based on a local approximation, while health expenditures are very skewed with a long upper tail. Alternatively, this calculation may overstate the value of insurance if spending on medical care produces little benefits due to the moral hazard effects of insurance. Thus, while the effects of the insurance expansion on labor supply are likely to be sizable, it is difficult to be very precise about the expected magnitude of these effects. 4. Data and empirical strategy 4.1. Data The data we use are drawn from a series of cross-sectional surveys, the Survey of Family Income and Expenditure (SFIE), 6 collected annually in Taiwan from 1969 to the present. Our primary analysis uses six surveys, covering the years 1979 to1985 but excluding 1982, the year in which the health insurance program for government employees dependents took effect. Since the program was implemented in the middle of the year on July 1st, it is unclear to what extent this year was affected by the program. Our second analysis uses data from the years , the most recent years available. Again, we drop the year in which the program takes effect (1995) from the analysis. Unfortunately, only 2 years of data ( ) are available for the period after implementation of National Health Insurance. This data limitation, combined with the fact that the Farmer and Labor Insurance programs were changing in the 1990s as well, may make it difficult to isolate the impact of the National Health Insurance program on labor force participation. The SFIE is a household survey that was conducted by the Department of Budget, Accounting and Statistics in Taiwan, with the interviews and field work arranged by the local government. The sampling procedure was designed to represent the civilian non-institutionalized population in Taiwan. A sample of 14,000 to 16,000 registered households was selected and interviewed during each study year. The number of people covered in this period totals from 57,000 to 77,000. Unfortunately, we can not follow the same household through time. The main information collected in this survey includes: (1) family composition and basic individual information (including age, family relationship, whether or not employed, sector of employment, occupation, job title), (2) housing conditions and facilities, and (3) individual income and family expenditures. The data are collected both from interviews and from diaries. At the initial interview, questions are asked about individual basic information and the major categories of income and expenditures over the past year. A small sample of respondents is required to keep diaries and is visited regularly by inspectors. The results of this control group are used to monitor quality of the interview survey. According to Deaton and Paxson (1994) the data are of good quality. 6 To obtain a public release data file, contact Directorate-General of Budget, Accounting and Statistics, Executive Yuan, Republic of China. 9 Y.J. Chou, D. Staiger / Journal of Health Economics 20 (2001) Our sample is restricted to married women who are between the ages of 20 and 65 and whose husbands are paid employees in the public or private sectors. 7 The sample is further restricted to women who are the household head or married to the household head, because determining marital status and identifying the spouse is only possible for the household head in the SFIE (although marital status is available for every individual after 1988). We exclude women from agricultural families and women whose husbands are self-employed or an employer, because these women are likely to work in a family business and their labor force status is often ambiguous (e.g. there is less distinction between housekeeper, employed and self-employed ). We exclude single women (who might serve as an alternative control group) for two reasons. First, single women who are not household heads cannot be identified prior to Second, labor force participation rates among single women (both their levels and their trends) are quite different from married women, making them a poor control group. Thus, we gather a treatment group of married women whose husbands are employed in the government sector and a control group of married women whose husbands are employed in the non-agricultural private sector. Non-working women in the treatment group (wives of government sector employees) can obtain health insurance through their husbands beginning in July 1982, while non-working women in the control group (wives of private sector employees) cannot obtain health insurance until March The final sample for consists of 34,223 women (about 5500 women per year), of which 7456 (22%) have husbands employed by the government. The sample for consists of 27,753 women (also about 5500 women each year), of which 4185 (15%) have husbands employed by the government. About 8% of the total labor force works in government jobs in Taiwan. In our sample, government employment is over-represented because we exclude the self-employed and agricultural households (both large sectors in Taiwan) and because married household heads are more likely to work for the government. The decline over time in the fraction of our sample working for the government is consistent with published statistics (The Executive Yuan, 1997) and reflects the rapid growth of paid employment in the private sector over the last 20 years in Taiwan. We construct two closely related measures of employment status, based on a question about labor force status during the month of December that was consistently surveyed from 1979 to We define being in the labor force to include four categories: employer, employee, self-employed and no-pay family workers. Those who are not in the labor force are classified as students, housekeepers and others (over age 65 and those with a disability). Alternatively, we construct a variable indicating whether a women is an employee conditional on being in the labor force. Labor Insurance primarily covers women who are employees of companies or factories with five or more employees. 8 Therefore, the employee category corresponds to women who are working in the covered sectors, i.e. in 7 Two types of employees in the public sector are identified in the survey: government enterprise and government. Only about half of the employees (civil servants) in the government enterprise sector are eligible for health insurance benefits for their spouses. We exclude government enterprise employees from our analysis. However, we derive similar results by including the small proportion of employees working in the government enterprise sector. 8 Some other groups are eligible for Labor Insurance. Most notably, 1988 amendments materially expanded eligibility for Labor Insurance. However, during each of our study periods ( and ) eligibility remained essentially constant. 10 196 Y.J. Chou, D. Staiger / Journal of Health Economics 20 (2001) Table 2 Husband s income (1991 NT dollars), a Husband s employment Total sample Government employee Non-government employee Husband s education Husband did not attend high school Illiterate (86379) (53349) (88154) Literate (91674) (60684) (94650) Elementary school (100553) (85348) (101514) Junior high school (115091) (96465) (118021) Husband attended high school High school (occupational) (155528) (100914) (172196) High school (senior) (145830) (101467) (157305) College (occupational) (192426) (118079) (240564) College (academic) (231395) (140056) (283659) Graduate school (300946) (206825) (410035) a Standard deviation in parentheses. jobs that provide health insurance coverage. We would expect the availability of spousal coverage to reduce the likelihood of working in the covered sector (being an employee ) given that a women was working. For some of our analysis, we restrict the sample to a low education group, based on the husband s educational attainment. As discussed in Section 3, we expect that a women s labor supply response to the availability of insurance will depend on other income available in the household (e.g. her husband s income and non-labor income). Rather than using the husband s actual income (which may be endogenous), we differentiate women by their husband s education. As can be seen in Tables 2 and 3, a husband s education is strongly related to his earnings for both government and non-government workers. In the sample, we define the low education group as having a husband who did not attend high school. In the sample, we define the low education group as having a husband who Table 3 Husband s income (1991 NT dollars), a Husband s employment Total sample Government employee Non-government employee Husband s education Husband did not attend college Illiterate (147461) (60479) (149837) Literate (210463) (87354) (214147) Elementary school (257045) (162356) (260092) Junior high school (210013) (216357) (209721) High school (occupational) (285787) (267755) (288317) High school (senior) (282340) (192538) (293367) Husband attended college College (occupational) (357257) (341990) (362326) College (academic) (432129) (318905) (478824) Graduate school (436618) (316908) (506034) a Standard deviation in parentheses. 15 Y.J. Chou, D. Staiger / Journal of Health Economics 20 (2001) Fig. 3. Labor force participation, figure presents trends for the total sample, and the bottom panel presents trends for only the low education subsample those women whose husbands did not attend high school ( ) or college ( ). The proportion of married women working has trended steadily upward in Taiwan. 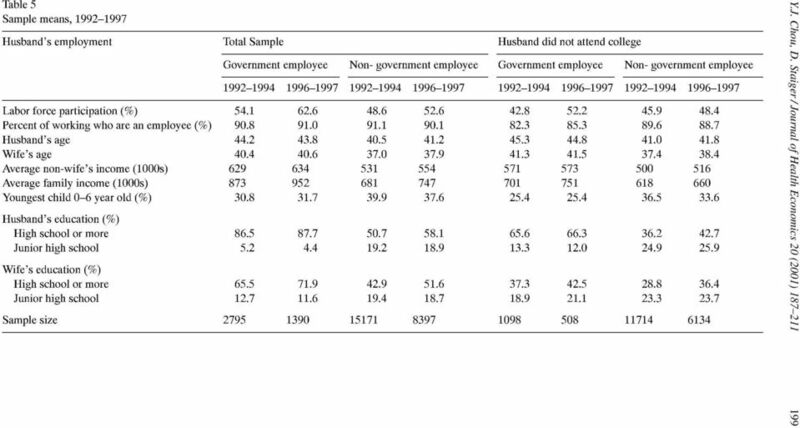 More importantly, in 1982 and 1995 there is a clear shift in the proportion of government employees wives working relative to non-government employees wives. 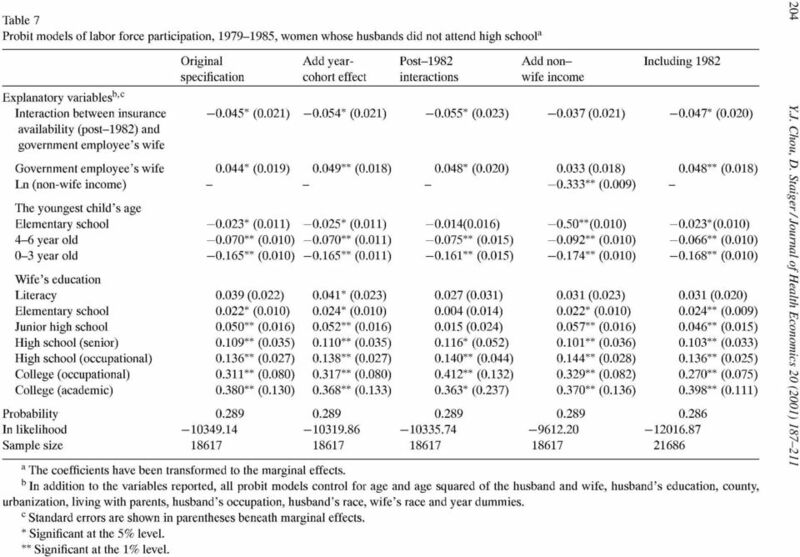 Between 1979 and 1985 there is a relative fall in the labor force participation of government employees wives that is most apparent among the women whose husbands did not attend high school and seems to closely coincide with the availability of health insurance in Similarly, the availability of health insurance for wives of non-government employees beginning in 1995 is associated with a relative fall in their labor force participation at the same time and that was also most pronounced among women whose husbands were less educated. 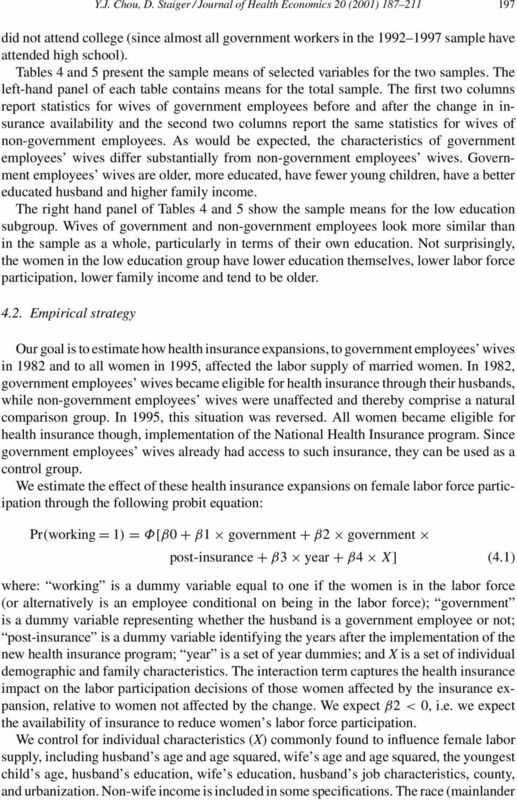 This is precisely what we would have expected based on simple theory: The availability of health insurance reduced the incentive to work for government employees wives in 1982 and then for non-government employees wives in 1995 and the effect was largest for women whose husband have low earnings. 19 Y.J. Chou, D. Staiger / Journal of Health Economics 20 (2001) because this is where the primary effect on labor supply appears to be concentrated. The first column of Table 7 repeats the estimates from the original specification for comparison. In the second column we add a full set of year-cohort interactions, based on 5-year birth cohorts. One might expect that time trends in labor force participation differ by age, and that these might bias our results since government employees wives are considerably older than non-government employees wives. Adding year-cohort effects increases the estimated impact slightly. 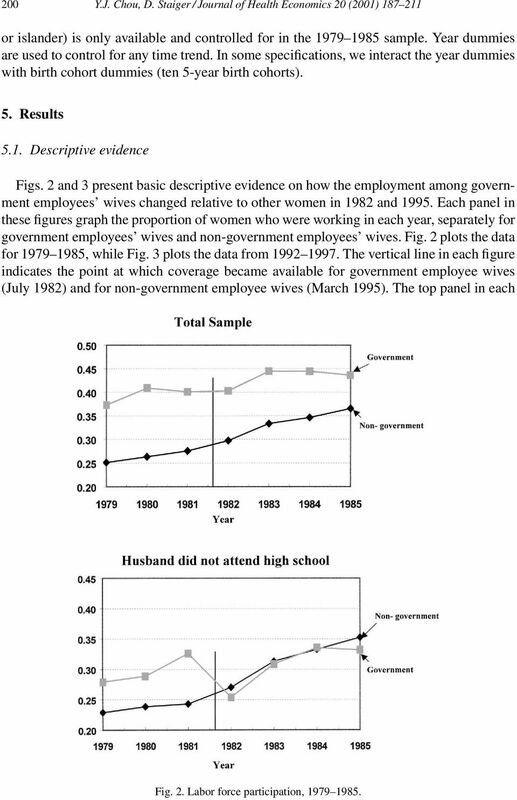 In the third column we conduct a similar exercise, interacting all of the control variables with a post-1982 dummy to see whether other covariates can explain any of the pre-post decline in labor force participation among government employees wives. Again, the estimated impact increases slightly. In column 4 we control for the log of non-wife income. This variable is arguably endogenous, but also may have followed different time trends for government and non-government workers so that omitting it introduces bias. When we control for non-wife income it has the expected negative sign (through income effects on labor supply) and our estimated effect become somewhat smaller but remains negative and marginally significant (P = 0.08). In the final column, we investigate whether including the first year following the change in insurance availability (1982) affects the results and again find the estimate to be robust. Overall, these estimates from the period suggest that the availability of subsidized health insurance that was not linked to employment had a sizable negative impact on a women s probability of working. 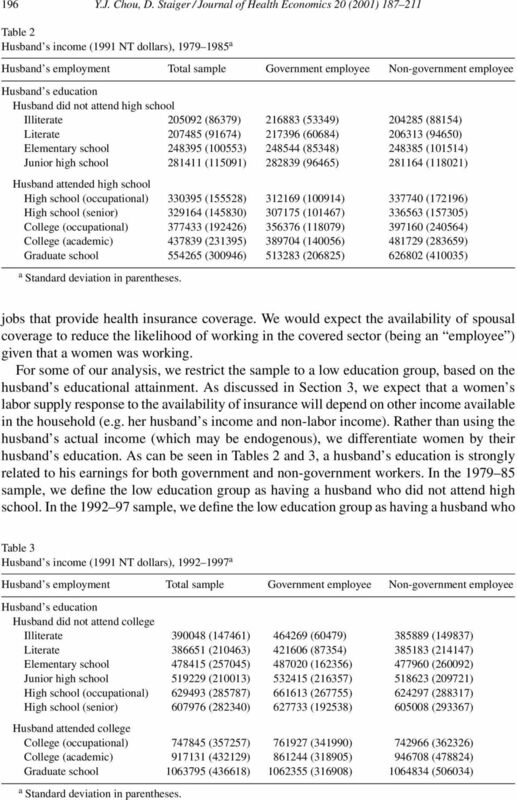 The estimated impact is largest among women with less educated husbands and is not particularly sensitive to reasonable changes in the specification Probit estimates: If wives of government employees worked less after insurance became available to them through their husbands in 1982, then we would expect the wives of non-government employees to work less after insurance became available to them through National Health Insurance (NHI) in early Tables 8 and 9 report probit estimates analogous to those Table 8 Probit models for labor force participation, a Total sample Husband did not attend college Husband attended college Explanatory variables b,c Interaction between insurance (0.018) (0.028) (0.025) availability (post-1995) and nongovernment employee s wife Probability In likelihood Sample size a The coefficients have been transformed to the marginal effects. b In addition to the variables reported, all probit models control for husband s employment, youngest kid s age, wife s education, age and age squared of the husband and wife, husband s education, county, urbanization, living with parents, husband s occupation and year dummies. c Standard errors are shown in parentheses beneath marginal effects. Significant at the 5% level. 21 Y.J. Chou, D. Staiger / Journal of Health Economics 20 (2001) of Tables 6 and 7. Once again, we estimate models of the probability that a women worked for the whole sample and then separately for wives with more and less educated husbands. Since non-government employees wives are now getting the insurance, we focus on the interaction between being the spouse of a non-government employee and the years (when insurance was available to these women). Since other coefficients are quite similar to the earlier tables, we only report the coefficient from the interaction term. 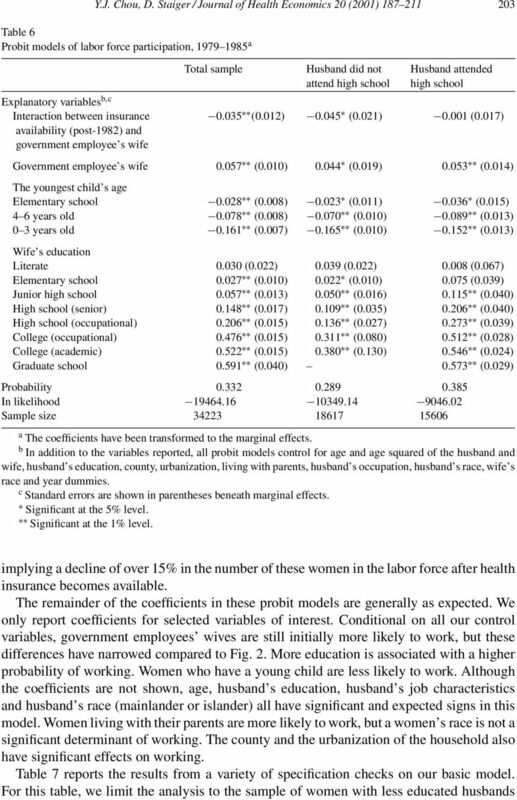 The coefficient estimates on the interaction term in these models are quite similar to our earlier estimates: the availability of insurance in was associated with a decline of 4.6 percentage points in the labor force participation of non-government employees wives relative to government employees wives, with larger effects (6.7 percentage points) among wives of less educated men. Not surprisingly, with only 2 years of post-nhi data these estimates are not as precise as in Table 6, but are still significant at the 5% level. Table 9 reports the results from specification checks parallel to those reported in Table 7, using only women with less educated husbands. Once again, the coefficient estimates are reasonably robust to these specification changes. Overall, the results are quite consistent with estimates based on the expansion of Government Employee Insurance to cover spouses in Probit estimates of working in the covered sector Employer provided insurance was only available to employees, and not to employers, the self-employed and family workers. Therefore, with the availability of insurance through a spouse or through National Health Insurance, working women had less incentive to work as employees, i.e. in the covered sector. Table 10 investigates whether the fraction of working women who were employees fell after insurance became available. The table reports estimates of probit models of whether a women was an employee, conditional on working. The specifications are similar to those in previous tables. 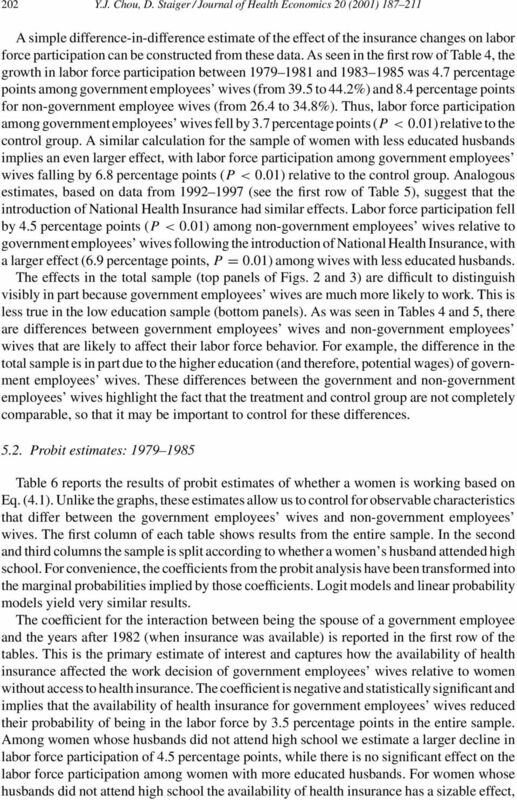 The top (bottom) panel of the table reports the coefficient for the interaction between being a government (non-government) employees spouse and years after 1982 (1995). To conserve space, we present only results for wives of less educated men for whom the effects are expected to be largest. The estimates for wives or more educated men are uniformly small and insignificant. 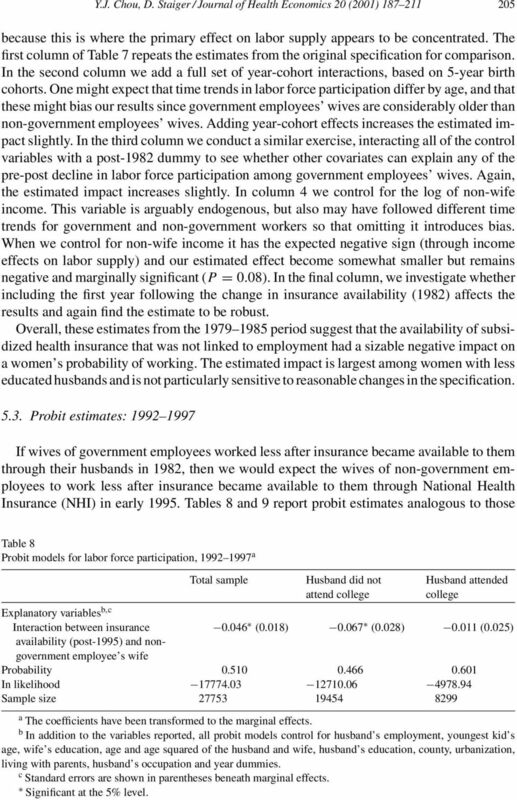 The top panel of Table 10 suggests that there was no detectable effect of insurance availability on the probability that the working wives of government employees were in the covered sector after For example, the coefficient in the original specification (column 1) is not significantly different from zero and suggests that participation in the covered sector fell by only 0.8 percentage points. 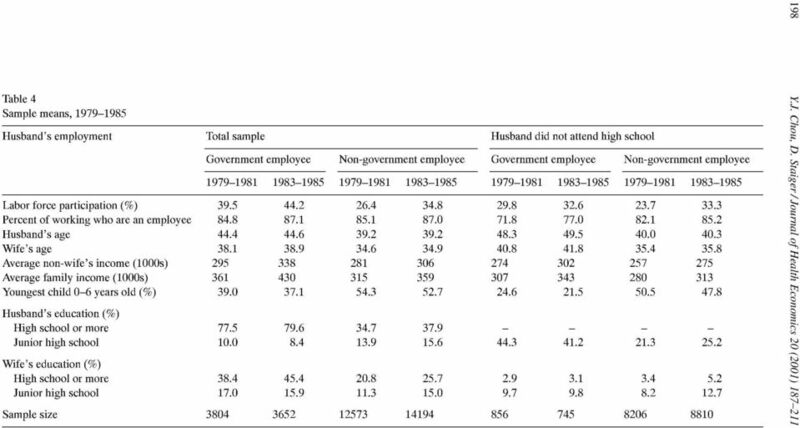 There is some weak evidence in the bottom panel of Table 10 that participation in the covered sector fell for non-government employees wives after they became eligible for National Health Insurance in The coefficient estimates suggest that participation in the covered sector fell by 2 3 percentage points among the working wives of non-government employees and these estimates are sometimes marginally significant. 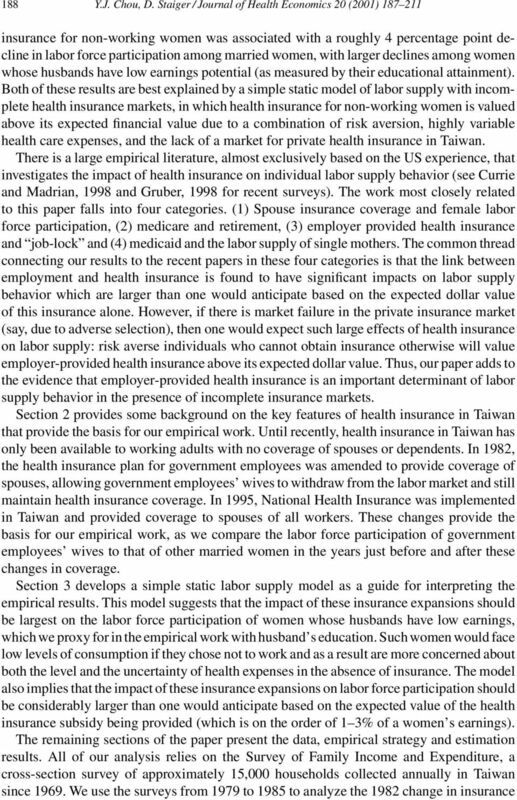 Given that the vast majority (80 90%) of working women are in the covered sector in Taiwan, it is perhaps not surprising that insurance would have only a modest effect on participation in this sector and that such a small effect would be difficult to detect. 23 Y.J. Chou, D. Staiger / Journal of Health Economics 20 (2001) Fig. 4. 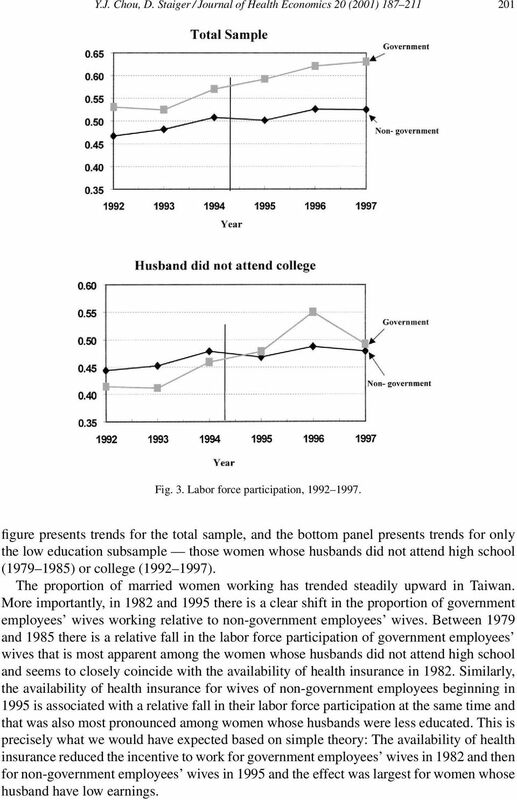 Turnover in government sector in Taiwan Evidence on sorting between sectors One possible interpretation of our findings is that men with non-working wives sorted into government jobs after spousal benefits were offered and then sorted back into non-government jobs after National Health Insurance. Our assumption is that this type of sorting happens slowly, so that the short-run effect we estimate is primarily due to labor supply effects on wives and not due to the self selection of couples into jobs. There are three pieces of evidence that support this assumption. First, as can be seen in Fig. 4, turnover (both entry and exit) is very low in the government sector in Taiwan and has changed little over the study period. 9 In our sample, turnover might be expected to be even lower since we only consider married couples (over 80% of government employees are married). These low turnover rates limit the amount of sorting that could have occurred, and if there was sorting we would have expected some change in turnover rates after the availability of insurance changed in 1982 and A second reason to think that our results are not due to sorting is that the estimates of the effect of insurance availability on labor supply are not sensitive to how one controls for characteristics of the couple such as education or number of children. For example, without controls for individual characteristics (i.e. only year dummies, a dummy for government employees wife, and the interaction term) the estimates from Tables 6 and 8 are quite similar: for the total sample we estimate a reduction in labor force participation of 4.2 percentage points in 1982 and of 4.6 percentage points in 1995 (compared to estimates of 9 Information on turnover rates comes from Statistical Data for Government Employees Insurance, Republic of China, published by the Central Trust of China, 1998. Do Retiree Health Benefits Cause Early Retirement? The Effect of Employer-Provided Health Insurance on Job Mobility: Job-Lock or Job-Push? Individual Health Insurance within the Family: Can Subsidies Promote Family Coverage? How Does Health Insurance Affect the Retirement Behavior of Women? In Search of a Elusive Truth How Much do Americans Spend on their Health Care? When Will the Gender Gap in. Retirement Income Narrow? When Will the Gender Gap in Retirement Income Narrow? August 2003 Abstract Among recent retirees, women receive substantially less retirement income from Social Security and private pensions than men. The Cost Of Providing Health Care Benefits To Early Retirees by Paul Fronstin, Sara C. Snider, William S. Custer, and Dallas L.
Tax Benefits for Graduate Education: Incentives for. Whom?